With that out of the way lets move onto an issue which is relevant to everyone who buys this case. Removing the front Bezel. 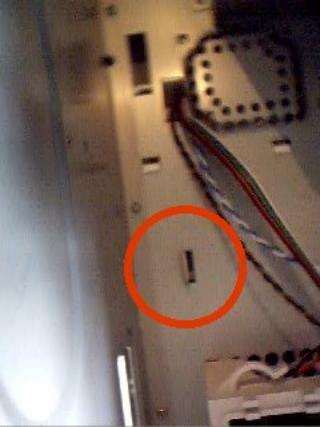 One must pay attention to two items, a hidden tab and a screw. 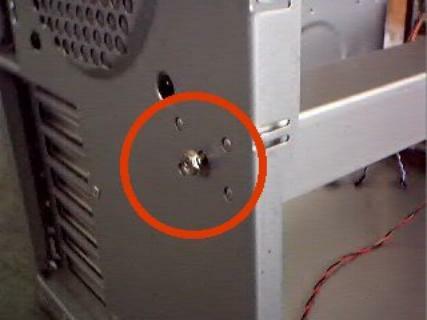 You are going to need to remove this screw, which is directly to the left of the fan cage. 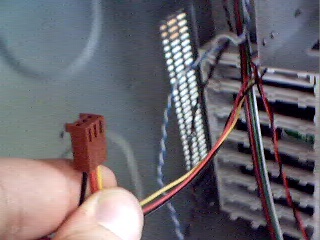 Also be aware that you are going to have to press this tab which is somewhat hidden, right between the top right edge of the fan cage and the wire outlet. 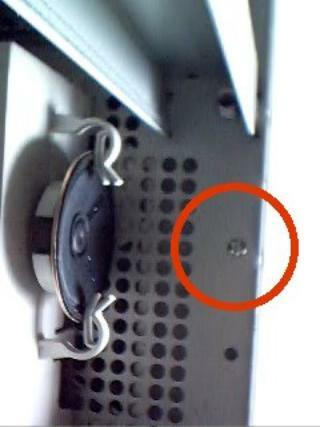 What I suggest is that you remove the screw and get the bottom loose by pulling the bottom of the bezel away from the case. Now while pulling gently from the bottom of the bezel depress the tab shown above and the entire bezel should now come off after you get the top part free. The first time it might be a little bit hard, but as you take it off and on it gets easier to do so. 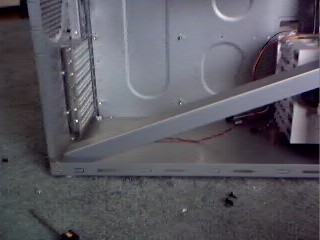 and pull up on the other side, the front side of the case that is, it should come right off. The way I look at this case and think of what I am paying for, it seems that I am paying for a wide, well built, nicely designed case. For those who are not phobic of cutting metal you shouldn�t necessarily focus on this case for it�s built in 3 120mm fan mounts. You should look for any case that you can easily modify to meet your needs. Having said that, I still recommend this case to both the metal cutting friendly camps and the not so metal cutting friendly camps. As it is simple just a well built case. Another thing to know is that this sucker is very heavy, the metal used is perhaps 1.75 - 2 times thicker than the metal used on my Enlight 7237. Making it quite cumbersome to move around. But that�s all good, it�ll give you a chance to shape them biceps. Hopefully this will serve as a guide for people who are interested in this case and perhaps attract people who have never heard of this case before. I certainly recommend it. If you have any questions please do not email me, rather post them in the forums under ???? for all to see. I will check there frequently. Keep an eye on this site for subsequent articles/reviews as I will have modded pics of this case as well as a hefty amount of Athlon Overclocking info.